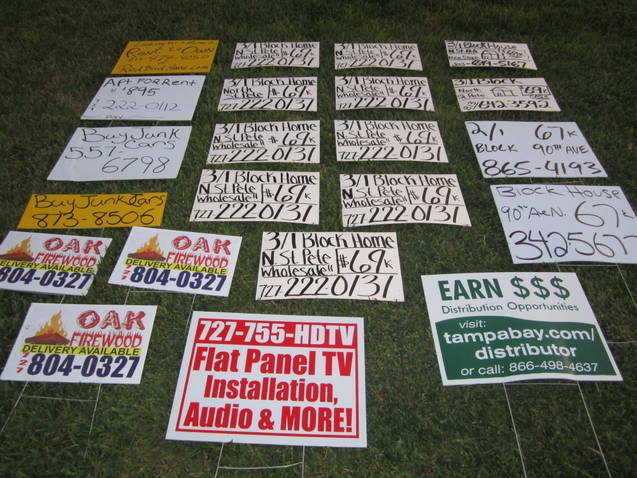 Snipe Signs. You see them tacked up on utility poles, and at busy intersections in the right of way. Snipe Signs. 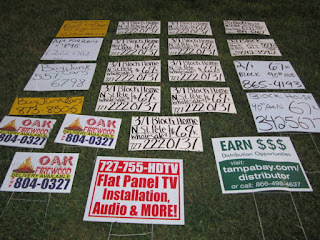 Definition - Any sign of any size, made of any material, including paper, cardboard, wood and metal, when such sign is tacked, nailed, posted, pasted, glued, or otherwise attached to trees, poles, fences or other objects, and the advertising matter appearing thereon is not applicable to the premises upon which said sign is located. There are a lot of things that can make a City look tacky and snipe signs are one of the biggest forms of visual blight. All Cities have a snipe sign problem of one sort or another. You can never stop this activity entirely for two simple reasons: it works and it's cheap. Up until recently the City of St. Petersburg had a very aggressive program dealing with snipe signs and the results had been pretty good. There was a person in the St. Petersburg Codes department working primarily on the snipe sign problem, and when they got stuck finding the business that placed the sign they could call on a Police Detective, Det. Krickler, who like most of us hates to see our city littered with these signs. The program worked like this: If signs were not removed after a warning period a citation and fine would be issued for an ordinance violation. The program was successful at reducing the number of signs and for the most part produced enough revenue in fines to offset the cost of the inspector. You can’t say that for many of our City’s programs. More recently the city has started a “robo calling” project that calls the numbers on the snipe signs with a recorded message notifying the business of their ordinance violation. To avoid detection and fines and the City's robo call program, snipe sign businesses have started to use what are called "burn phones" for the call back number. Once the City begins a robo call campaign to the burn phone, the business just throws the phone away, and because the phone is difficult to track, the individuals responsible are often difficult to find. So as a result we’re seeing more of these signs around our city – but what happened to the previous enforcement program? A few years ago when the Codes “Compliance Assistance” department was reorganized under the Foster administration. The City employment rules requiring a college degree for department directors were modified to support the appointment of a Codes Director who is – it appears - simply not up to the job. Since this change in the Codes department enforcement of our ordinances has languished and Code enforcement in general has not been up to its previous high standards. Unfortunately, this takes the edge off the department’s effectiveness, particularly with regard to snipe signs. While the Mayor’s election campaign talked a good game about “the broken window theory” and quality of life issues, the results speak more loudly than those promises. Neighborhoods are complaining about the recent proliferation of signs, but their complaints fall on deaf ears. Strong Codes enforcement usually upsets the violators, and some of those violators can have strong voices also. However, it is up to our government to enforce the rules – that is what we expect them to do and that is what we pay them for. This is just another example of where some leadership from the top along with simply enforcing the Ordinances on the books would go a long way in solving a problem. But the evidence shows we’ll need stronger leadership and a more capable Codes director before we can expect any change.